How do I get the place looking ready for visitors in under 15 minutes? Here’s where to start the spruce-up when your guests are already on their way. GETTING THE HOUSE ready for people to call around always seems like a simple task, until you get that “on the way!” text and realise the place is in total disarray. Of course you want to see them, but looking around at the toys and odd socks strewn around the floor, and the surfaces you haven’t had a chance to clear up for a couple of weeks, you realise there’s more to do than just rearrange a few couch cushions. So how do you get your home ready for guests when time is running short? Here are four tactics to make the place look presentable in 15 minutes or less. Start by doing a quick scan around and picking up anything that is out of place. A storage basket is portable and can help to hide clutter in plain sight. For a high-quality, hand-crafted option, Ciaran Hogan makes traditional Connemara Turf Baskets that can just as readily be used to gather up stray toys and bits and pieces. If you’re on a budget, try TK Maxx or Homesense for a basic wicker basket. Next clean the surfaces that are most likely to be used or seen – the coffee table, the TV cabinet, the kitchen table. I usually do this is with a cloth in one hand and a handheld vacuum in the other, and I add a couple of drops of essential oil to the filter pad for a fresh scent. If you don’t have a handheld vacuum, opt for one dry cloth and one damp cloth instead. Freshening up your bathroom is the ultimate pre-guest quick solution. Squirt some toilet cleaner down the loo and give it a swish around. Wipe down the wash basin and change the hand towel. Then light a scented candle for a pleasant aroma. I love Field Day for its natural ingredients – less likely to affect guests with potential allergies. Finally, remember that your visitors will appreciate the welcome you extend much more than your clean loo or dust-free coffee table. 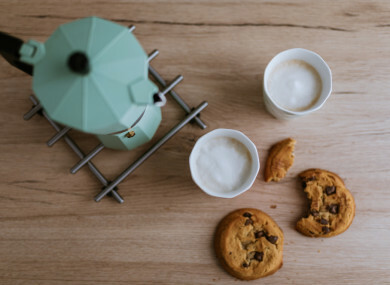 Even if the kitchen cupboard only has the basics in stock, simple sandwiches cut into fancy triangles or biscuits presented on a pretty cake stand (like this ceramic one from Dunnes Stores) will kick things up a gear. Email “How do I get the place looking ready for visitors in under 15 minutes?”. Feedback on “How do I get the place looking ready for visitors in under 15 minutes?”.